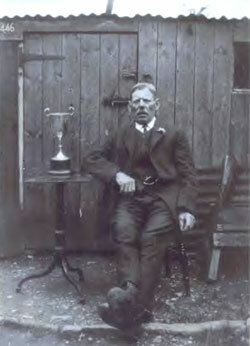 Mr Thomas Harvey pictured in the 1920s with the Cottagers Cup which is still presented today. 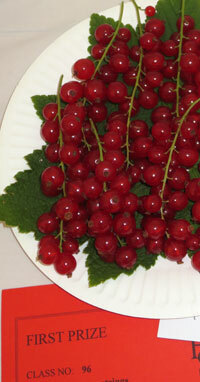 Nailsea Horticultural Society was established in 1852. At that time Nailsea was a small village in an agricultural area, the village itself dominated by mining and glass making industries. The aim of the Society was then, and remains now, to encourage good gardening practices. This poster advertises the 1916 flower show, or as it was then called, the “Annual Exhibition”. 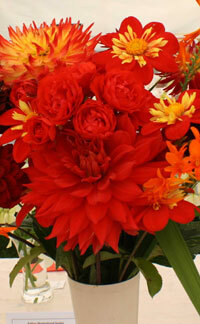 The Society held its first flower show in 1853 in a marquee near Old Church. Such an event must have had a great impact on the small, relatively close village community, but once established, the shows continued to be an important part of the social life of the community. There have been enormous social changes since the time of that first show with the decline of the heavy industries, major changes in local employment, greatly increased social mobility and a massive expansion in the size of Nailsea. 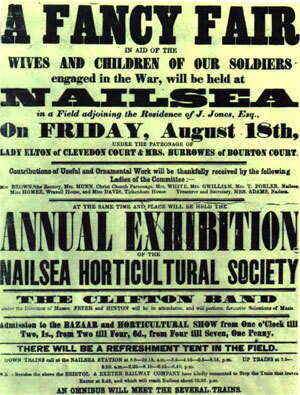 Throughout all those changes, with the exception of the war years, flower shows have continued to be held each year in Nailsea. The shows have fulfilled an important social function and have given individuals opportunities to show the results of their labours in a spirit of friendly competition. During the 1960s/1970s under the leadership of local horticulturalist Don Everitt, the Society introduced a series of monthly lectures and a Spring Show. The monthly lectures on gardening subjects continue to be very popular and the Spring Show is recognised as being one of the best daffodil shows in the area. Over the years the flower shows have been held in a number of different venues within Nailsea, both indoors and in marquees outdoors. For the past few years the shows have been held in Nailsea School – this new building provides a very pleasant venue which is appreciated by both exhibitors and visitors to the show. By organising its flower shows and gardening talks the Society seeks to maintain its aim of promoting good gardening in Nailsea and surrounding districts.